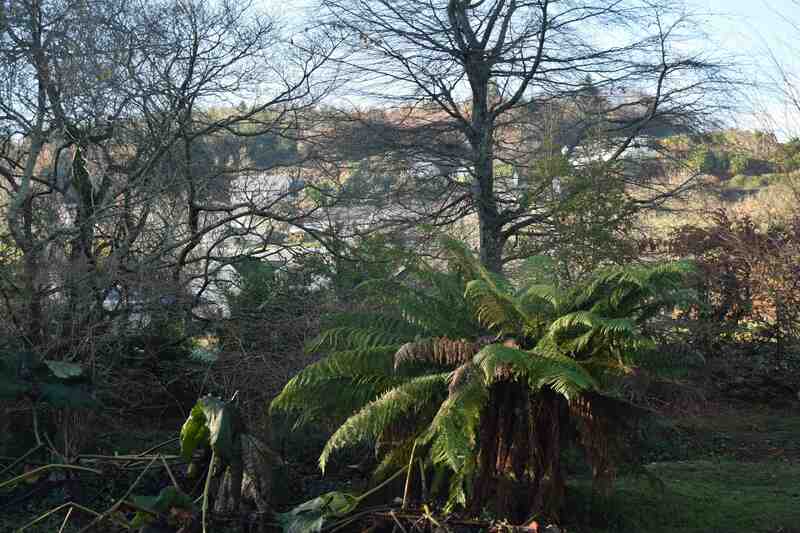 A few days late, a few photos of my weekend visit to Mount Usher, the last for the year, on a cold, bright day. Autumn leaves had fallen and there was not a lot of colour but still lots to see with long shadows and evergreen structures revealed. 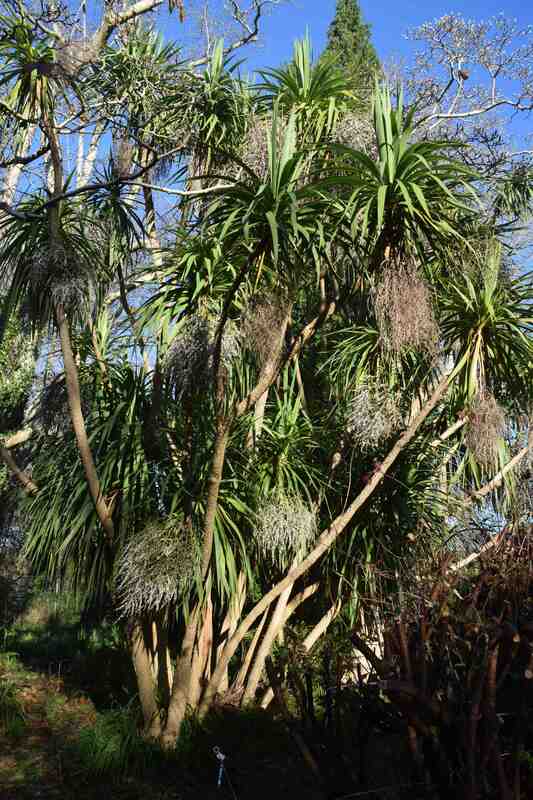 Although cordylines are not that popular here because their long, strappy leaves drop on lawns and clog up mowers I am still fascinated by their other-worldly appearance and when they are covered in hanging bunches of white berries they certainly make a statement in the garden. As the sun rose a little higher in the sky its rays moved across the frozen ground and turned frost to steam – an eerie effect. Stripped of foliage, the shelter trees exposed views of Ashford around the garden. 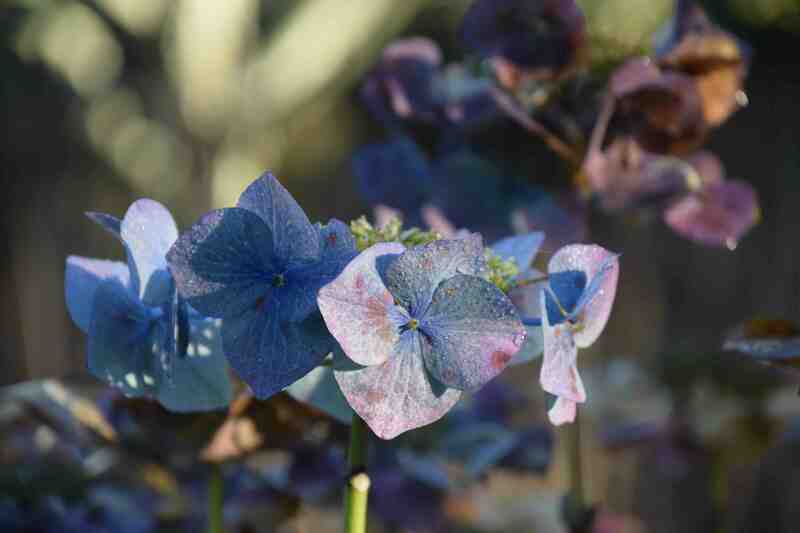 A few hydrangeas had exposed the blackening effect of the sharp frost and gave delightful, jewel-like colour. 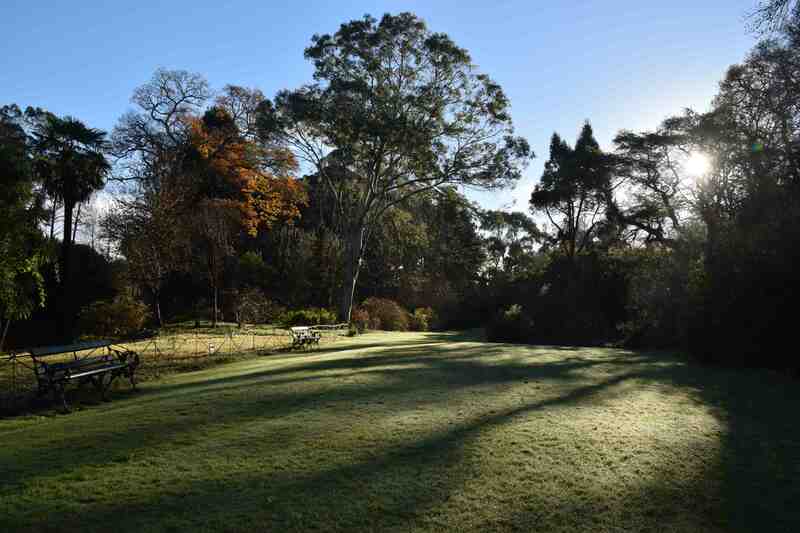 You’re certainly doing a good job of widening information on Mt Usher – justifiably so. It is a wonderful garden. I am not a fan of the Cordyline myself but don’t forget the best thing about it is the powerful scent from those flowers. I think someone told me the bees adore them too. 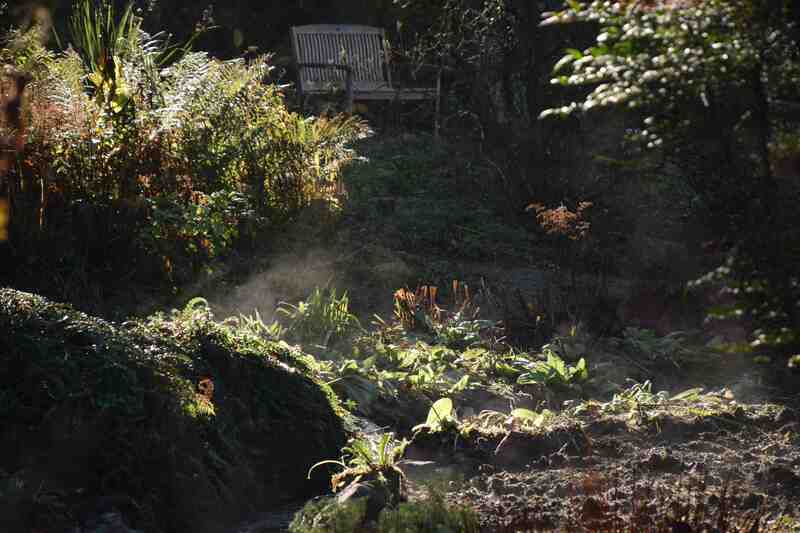 Probably on the same morning my tree trunks were giving off little puffs of steam too. I never recall noticing that phenomenon previously, but you had the presence of mind to photograph it! I also discovered that the blackbirds were feasting on the berries of the cordylines – so much for them not eating white berries! Beautiful! What’s the weather like in there? Today I planted the whole ginger flower in a pot at home because the keikes are still feeding off the mother stem (which is the flower actually) I’m going to send you a picture in a few days. Some keikies were actually blooms and other were just plants; this is why I didn’t want to detach them from the main stem yet- to give them an opportunity to continue growing. I actually buried the flower in the soil so the keikes would root naturally when ready. The flower was actually full of roots along with the keikes. What happens to the plant in the wild is that the keikes fall when the flower dies, and then fall to the ground. I hope it works!